The purpose of Coinwarz essentially is to provide information regarding the profitability of Bitcoin versus other cryptocurrencies. Users will find this site to be a little technical and without prior knowledge, usage of this site may be a little confusing. With that said, its still usable by anyone and is quite interesting to play around with. 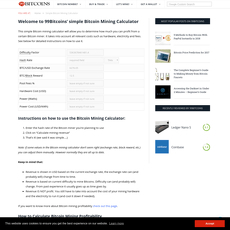 It contains several calculators for many different mining rigs and style. 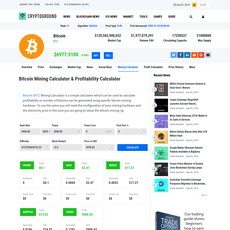 You can use the various calculators to calculate the cost of mining for just about any cryptocurrency with up to date information. On the homepage are some rather technical looking calculators that new comers may not understand. However, scrolling down a little will reveal a list of cryptocurrencies and their respective data regarding mining. There is a lot to be learned from this list for anyone of any experience level. 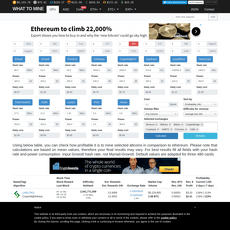 This list also compares altcoins to Bitcoin to determine which is more profitable to mine. This list however does not calculate profitability based on fees, exchange rate fluctuations, pool efficiency, or difficultly so please understand that any value you get is subjective and will vary from reality. Easy to use for anyone with a background in mining. Visually appealing and informative difficulty graphs. 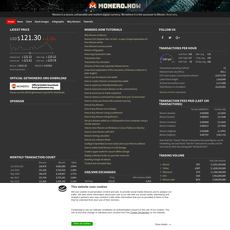 Full mining data profiles for hundreds of coins. 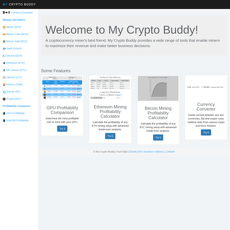 Makes it easy to sort coins by their profitability levels. 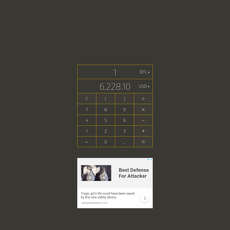 The mining calculator doesn’t up date in real time the price of a coin on a specific exchange. There is not very much educational information on the site that would explain things to a newbie.